Make a circular cut around the base of each ear of corn, about one inch from the bottom. Remove the leaves and divide into pairs. 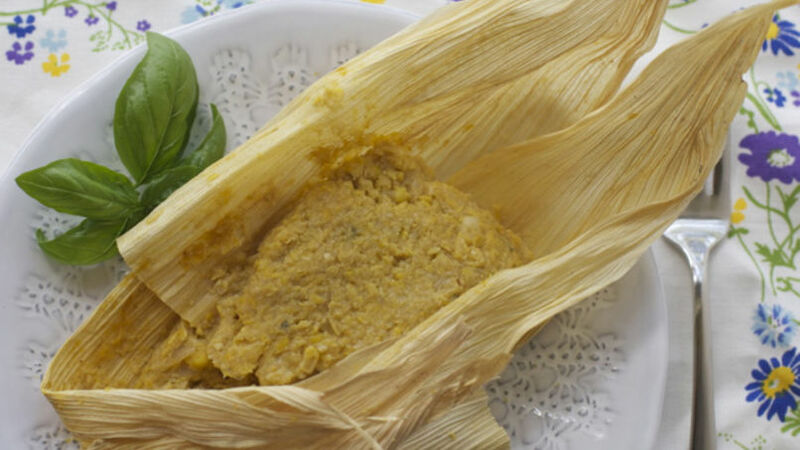 If you’re working with dry tamale leaves, soak them in hot water. Cut the kernels from each ear, separating them from the cob. Then process the kernels in a blender or food processor; the result should be a rough paste, not too smooth with some texture. Set aside. Heat the shortening or vegetable oil in a large pot over medium-high heat. Add the diced onion and paprika (or merquén.) Sauté for five minutes, stirring occasionally. Add the corn to the pot and cook for five minutes. Add the cornmeal and basil and cook for a final 10 minutes. The mixture should thicken and you should be able see the bottom of the pot when stirring. To assemble the humitas, place one corn leaf over the other, overlapping by around one inch. Place 3/4 to 1 cup of the cooked corn mixture in the center of the leaves. To close the humita, fold the sides of the leaves first, from the left and the right. Afterward, fold the top and bottom sides down to form a rectangular package. Secure the leaves with (cotton) kitchen string around the center. The finished package should resemble a bow-tie, or humita. Fill a large pot with water and add a little salt. Bring the water to a boil and place the humitas inside. Cook for 20 minutes and then drain. Let the humitas cool for five minutes before serving. To prevent the corn kernels from ‘flying’ everywhere when cutting, try using a Bundt pan. Place the tip of the corn cob In the center hole—this will steady the corn as you cut it, and the pan will catch the kernels as they fall. Try serving your humitas with sugar or tomato salad. You can easily reheat this dish over a Mexican comal or griddle; they’ll taste delicious!